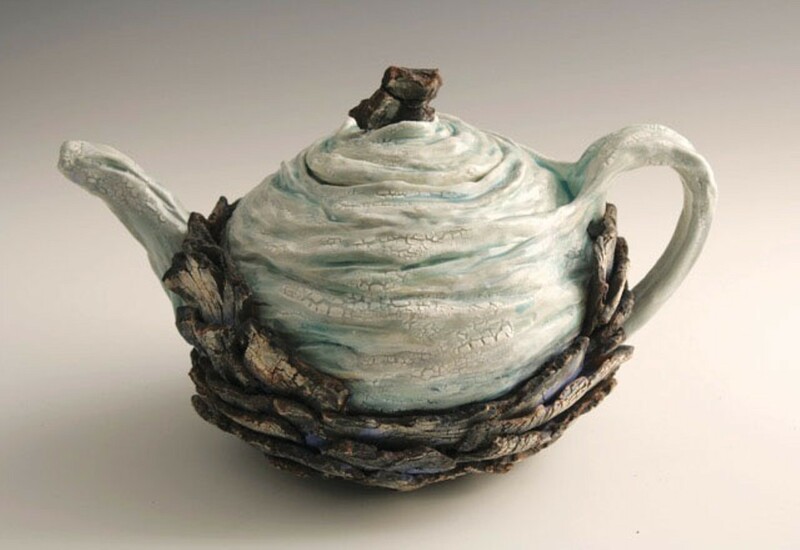 “Teapot for an Aquifer,” by Becky Evans. "Turf Spiral" occupies the front room of Humboldt-based land artist Becky Evans' new show Water Lines at Piante Gallery. 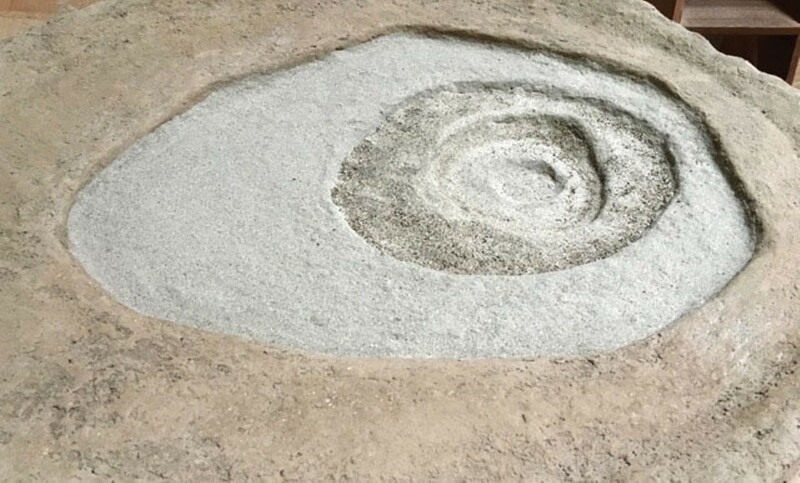 It makes an impression there — it's not what you expect to see, this mute obdurate hillock in the middle of gallery space, rolled inside out with its brown earth crust on display. The human concept of nature is almost infinitely plastic and this is the avatar of vegetation you get when that notion gets stretched to the point of transparency: a monoculture product, grass selected across generations for toughness and uniformity, spooled on a reel for convenience. As mathematically predictable, complex, visually striking, naturally recurring forms, spirals disrupt established categories. Concept and material resonate in Evans's installation: The spiral belongs to both nature and culture, and so does the material from which the spiral is made. "Turf Spiral" packs a potent symbolic charge. But most of the other works here derive their meaning from places and facts. Evans has been making art that responds to the California landscape for years, using foraged materials like alfalfa, madrone and lakebed clay to document natural and human-made change. Previous exhibitions explored this terrain by tracking river flow and tracing watersheds. In Water Lines the artist addresses subsidence — the sinking and desiccation of land occurring when groundwater supplies are exhausted, a phenomenon endemic throughout California and other western states. Maximum levels of subsidence have been reported in the San Joaquin Valley, where almost 100 years of pumping groundwater for industrial-scale agriculture has led the land to slump as much as 25 feet in some places. 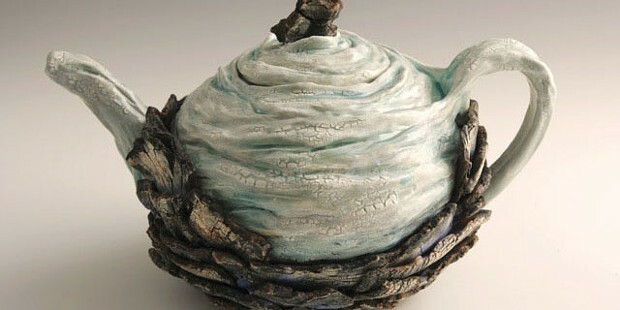 Evans commemorates that fact with a basin in papier mâché and mud — a dark, gritty platter that rises in a tiered series of plateaus from a central point. It turns out the contour lines that circle the basin's deepest point are founded on satellite data, each line representing a different snapshot of a shrinking aquifer. "Subsidence – San Joaquin Valley" re-houses a set of images, lending material existence to patterns that had previously existed exclusively as digital data. If the fine lines Evans incises take on vaguely familiar shapes, there's good reason: They map real channels along which water and bodies continuously flow, some of which (like Interstate 5), are visible to the naked eye while others (like the California Aqueduct) are not. 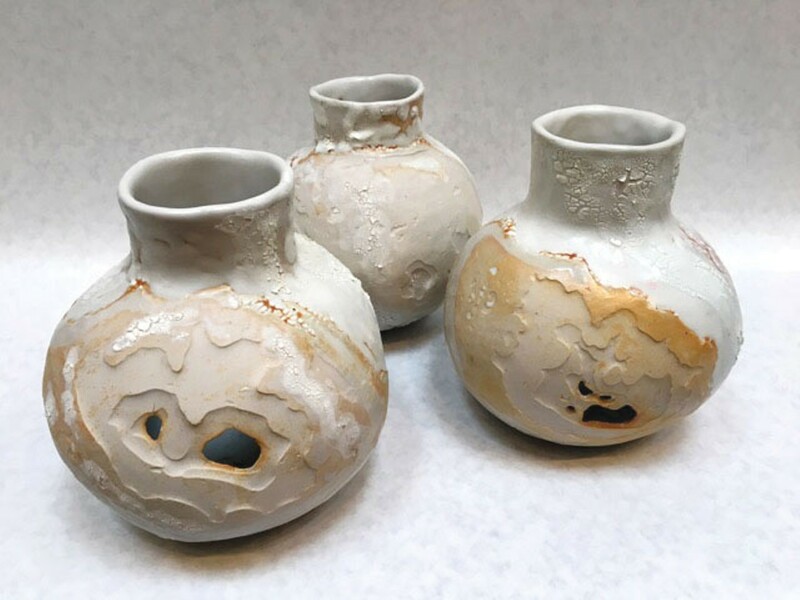 In the grouping of porcelain olla vessels titled "Maps of Subsidence from Merced to Delano," the unpainted vessels, with their wide mouths and looped handles, repeat forms with a long history of use among indigenous Californians. The contour lines that pattern the vessels' surfaces were created using resist on the fine-grained porcelain before it hardened — true erosion on micro scale. 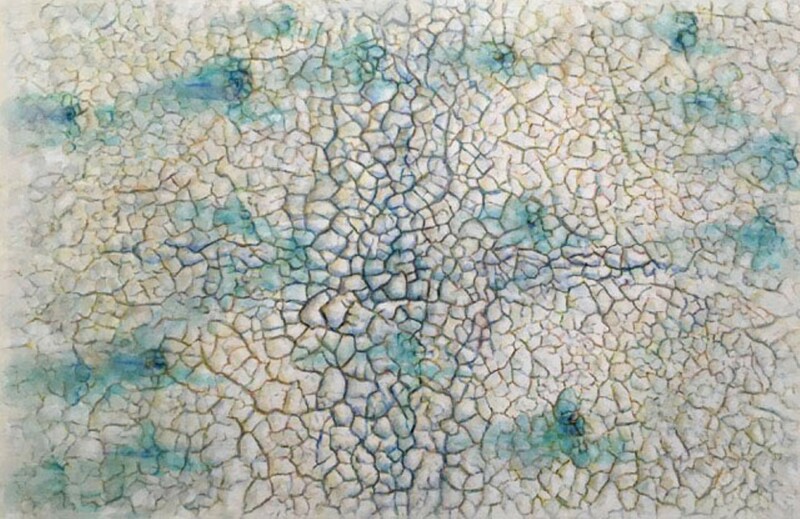 Evans' encaustic paintings depict the surfaces of dry lakebeds, surrounding vignettes of parched surfaces with a peripheral haze that makes the scenes both physical and dreamlike. A painting of Oregon's dry "Summer Lake," for instance, makes the absence at the picture's center seem both more and less immediate than in real life. The imaging process behind these works is data-driven. Shapes correspond to real coordinates. Contours are often occult but never random. Nothing is arbitrary and everything is interconnected. Significant forms repeat the contours of things that exist, although they cannot necessarily be seen. The impulse behind the work seems to be anti-monumental — rather than commemorating an enduring state, it chronicles change. This recalls works of art and architecture by a short list of fellow systems-visualizers, Maya Lin and Mark Lombardi for instance. But Evans said that one of her most important influences when it came to visualizing the unseen had been none other than Alexander von Humboldt, the legendary Prussian naturalist, explorer and county namesake. Humboldt was one of the first scientists to have conceived of the natural world as interconnected and reciprocal, and — as Andrea Wulf emphasizes in her recent biography — his ability to capture the imagination of contemporary audiences was buoyed by his innovative visualization techniques. Humboldt illustrated his published works with some of the first contour maps. He labored between 1799 and 1805 on a single large-scale drawing that would map speciation according to altitude. Like Evans' "Turf Spiral" and subsidence basin, these images are visually compelling and they brought information to life for their audience. Evans observed, "If people could see how much water is getting shipped away ... If they could see with their eyes how groundwater levels are receding throughout the region as a whole, many more of them would have a problem with it." Evans is undertaking something difficult but consequential in seeking to lend this unseen phenomenon memorable form. The works of art in Water Lines carry a message of change that is necessarily unwelcome — one that cannot be anything but sobering for its audience, and so is all the more necessary. They bring what lies beneath into haunting and sometimes appalling view, on the grounds that what can be seen can also be thought and discussed. Water Lines will be on display through Nov. 12, and there is an opening reception at Piante Gallery on Oct. 1 during Arts Alive!